Worried that your bicycle will get in wrong hands if left unsecure, then you should take a look at this unique bicycle designed by Kevin Scott. 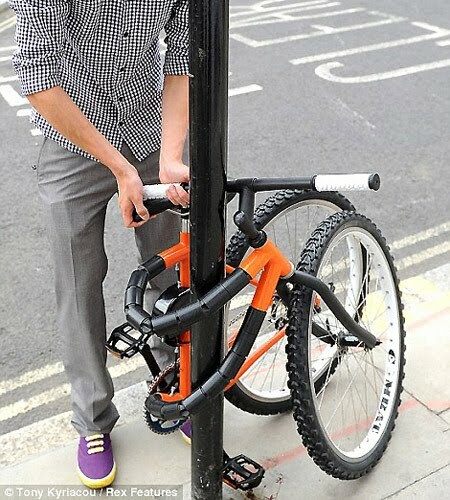 Scott’s bike uses a ratcheting mechanism in the frame to allow it to blend , then it can be wrapped around a pole to be locked up, making it almost impossible to steal. What an amazing photo – and what an ingenious invention. Still, sad that someone would have to go to such lengths to make a bicycle hard to steal. Clearly, thieves are a lot more numerous, persistent and skilled than they used to be! Technology is running towards peak in every field. Now for the safety of cycle, the designer has got their aim to get higher sales. Another great bicycle invention! I wonder how much it will cost you for this wonderful tranpo. But, is it really safe since you can bend the support used to connect the two wheels?